Friends of mine know just how much I love soup. I could eat it breakfast, lunch, and dinner for days on end without complaint. From creamy chowder, to chunky veggie delights, to ethnic wonders like Pho or borscht, I've yet to meet a soup I didn't like. Having soup out of a can is fine for lunch, but a dinner meal seems to call for a big bubbling pot. I've tried to pull out the old slow cooker every now and again, but I'm not a morning person. I would rather make something tasty on the fly then try to pull together even a few extra brain cells before 9am. When I first saw the campy ads for this new product, I had my doubts. 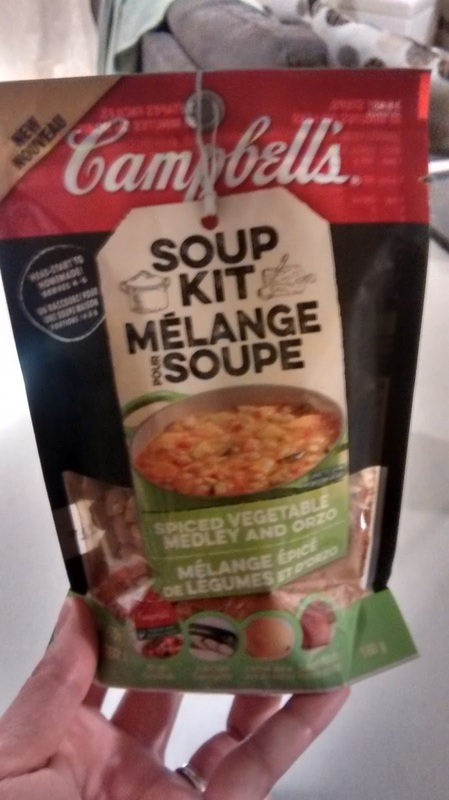 How could a pre-made product be as good as that soup that took her 4 hours? Not likely... Dried soup mix is often my last choice too, because of the salt content and the lack of real substance I feel often results. In fact, I passed over this exact product several times before putting it in my cart for this and two more reasons; the price was often listed at $4.29, which is a tad high, and it clearly states that the product requires not only the package, but also broth and fresh ingredients. If you aren't into meal planning, you could very easily use the ingredients meant to go with your package separately, and never have them handy when you actually wanted soup. This week during our grocery shop, it just so happened that the store had these kits on sale for $.99, and vegetable broth for $1.25 - a steep discount on each. I noticed that it also called for zucchini, which was already in my basket, so I decided to give it a shot. The instructions claimed the bag served 4-6, so at under $.75 a serving, the value definitely seemed to be there. After having opened the package and the broth, I realized that the soup also called for sweet potato. It's something I have in the house on occasion, but didn't today. I decided to cut up an equivalent amount of regular PEI's and add a little on to the cooking time to account for the swap out. I have to say, the first waft of aroma wasn't at all what I was expecting. There was a highly spiced, almost curry like smell that made me think the flavour was going to be very strong. I mean, the package said "Spiced," but the zucchini led me to expect something more Mediterranean for some reason. It also had that distinct packaged soup mix quality. The concerning freeze-dried texture that makes you wonder if it will take forever to soften or turn immediately to mush. 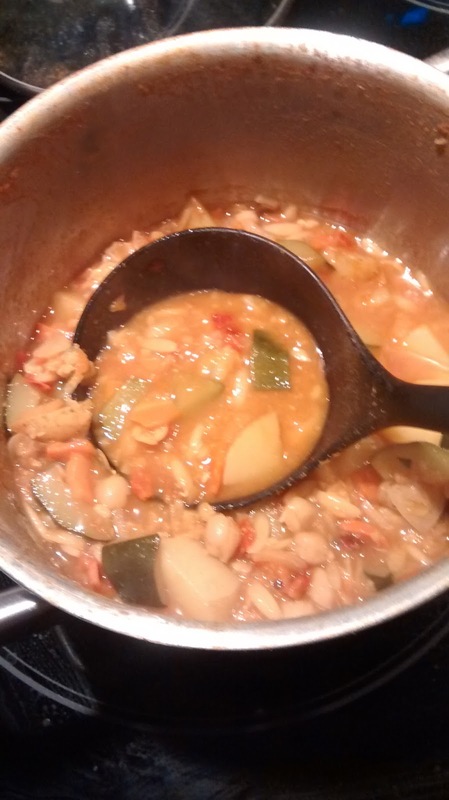 At the half hour mark, the soup was perfectly cooked and ready to taste. It was good, but my Eastern flavour profile expectation was dead on. Curry is not something I'm always in the mood for, but it worked out tonight. My son was not at all interested, however. The bean mix was nicely softened, and but not convincingly "fresh." Zucchini, sweet potato, and lemon juice are not enough to make it shine. I'm not sure if fresh spinach or plain yoghurt might add something that it's lacking. Having served my husband and I each one large bowl, there wasn't much left in the pot. A lunch serving at best. I have no idea how they thought 6 people could possibly share... as a small appetizer, I suppose? For dinner, with some crackers or a roll, 4 is a stretch. Overall, as something to keep in your cupboard (if you're willing to be flexible on the fresh additions the packaging recommends), it's not bad. It was totally worth the money I invested, but I'm not sure a price tag of over $3 will keep it on the shelves. I image it will be discontinued, so look for it in a clearance bin near you!